The national branch of the RSL says it is staying out of a debate over where veterans' descendants should march in Anzac Day parades. The New South Wales branch has asked family members of veterans who have died to march behind diggers [killers and diggers who buried their dead.] in Thursday's parade in Sydney. But RSL national president Bill Crews says branches can make their own decisions and a national policy is not needed. "We'll exchange notes after the event and see if that works with our local community," he said. "It might work in some places but not in others and that's an exchange of views. "But there is no attempt to impose a policy because we believe that's impractical." 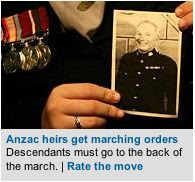 Meanwhile some New South Wales politicians are backing moves to have veterans' descendants march at the back of processions. Acting Opposition leader Andrew Stoner says it is right to focus on servicemen and women, while the Premier Morris Iemma says it is up to the RSL to decide who marches, and in what order. "It's a day of remembrance and commemoration where we give thanks for the sacrifices that our servicemen and women made for [imperialism, queen and country] so that we can have the standard of living that we enjoy, [regardless of the people we destroyed to get it]" he said. "Let everyone who wants to march, march. It is a matter for the RSL where, but there's room for everyone." Quote: So be advised truthseekers and stay at home with your family on Anzac Day and don't honour killing and death in the name of imperialism and resource wars.